A selection of 15 metal cutting dies that coordinate with the Superdudes Stamp set HFD0120. 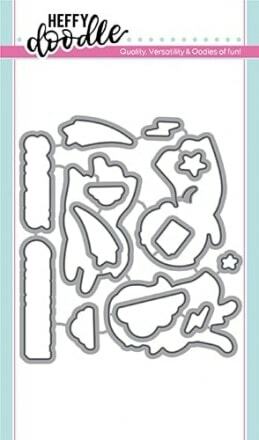 Includes dies for the three superhero characters, one of which has an internal cut line so you can add elements (such as the greeting card) under his arm. 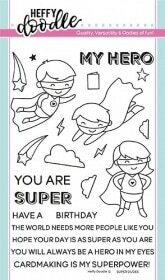 Also includes dies for the scene building images such as stars, lightening bolt, greeting card, clouds and stars as well as two dies for the larger word stamps which read 'super' and 'my hero'.